I like exploring the relationship between mediums of now and then. In my latest series, I'm using my own photographs, prints, paints and intriguing found-items juxtaposed in such a way that their familiar contexts are broken down and powerful new emotional associations come into being. I create these works using loose blend of overlapping elements. The elements say one thing ‘‘Individuality’’, yet placed together, the message is more complicated and less certain. Personal associations spontaneously arise in the viewer in an attempt to understand the whole and complete the story. These pieces are more like pictures of a state of mind, a distracted, half conscious state that causes jumble of unrelated things: scraps of memory, floating impressions, thoughts and feelings that float in a disorganised mix. I'm most interested in using visual images along with text, I oftentimes use traditional media as well as photography to spark ideas. I weave layers, colours, shapes and textures that softly but proclaim balance , harmony and integration. My artworks are created from an exploration into my psychic depths. The longer you look, the more you see. The layers of life are metaphors for my art. My hope is that when someone looks at one of my paintings, they make a connection and enter my world for a brief moment in time. My aim is to make the viewer interpret and to become more involved in my imageries. For me, to be successful as an artist, the viewer needs to stand in front of my work and feel something. To me, my art is about the process of discovery, the synthesis of my personal feelings, colour that inspires me and technique that I use : It's a piece of who I am. My work is inspired by the natural world. Its beauty and its cruelty. Its hostility and its hospitality. Its paradoxes and its contrasts. Copyright © 2010 All Rights Reserved. 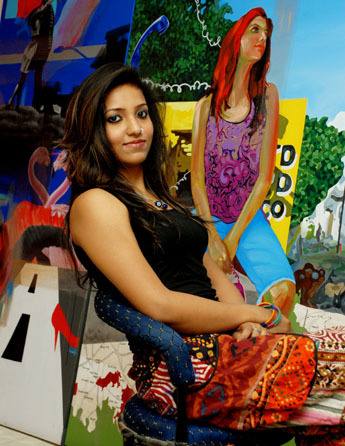 Vinita Dasgupta.